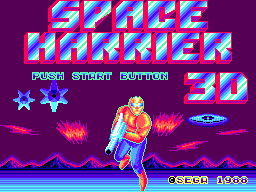 "The intergalactic warrior Space Harrier returns...in an all new 3-D adventure! The peaceful Land of the Dragons is again under attack. Evil creatures fill the land and sky. Euria, the magnificent white dragon, is being held prisoner in a diabolical trap. 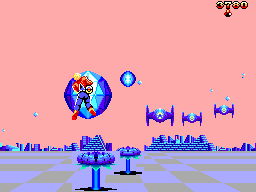 Only you, the Space Harrier, can set him free. But this time, the challenge is greater than ever before! 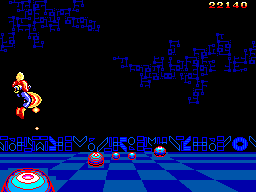 Put on your SegaScope 3-D Glasses. The screen will come alive with new 3-D graphics, enemies and wild new battle scenes! Only you stand between the peaceful dragons and defeat. Get ready for the battle ofa lifetime!"